One of the biggest myths in the Standard American Diet is that humans need to drink cow’s milk for healthy bones. Milk is a common drink in many households, which can make it difficult to give up milk when people learn about the negative health impacts of dairy foods. This product can be found in nearly every store that you visit, and it is a great source of nutrition. 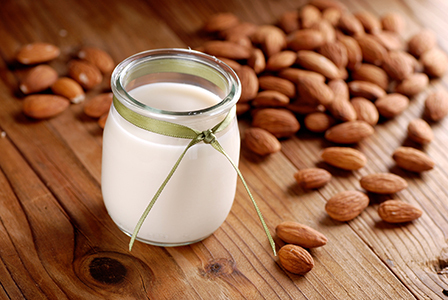 Many families like to use almond milk, especially because it can easily be made at home. Homemade almond milk makes it easier for you to save money if your family drinks a lot of milk on a daily basis. Also, homemade almond milk is a better choice than store-bought almond milk. Some people can’t have almond milk because of food allergies, so they choose rice milk instead. Rice milk is a little lighter than almond milk, and many people find it quite pleasant to taste. Look for rice milk at the grocery store, or you can also find many homemade rice milk recipes online. Coconuts are delicious and healthy, and coconut milk has a similar texture to cow’s milk. If you don’t like the “nutty” taste of nut milk, then you might consider coconut milk instead. This milk substitute isn’t quite as common as some of the others listed in this article, but it is a great option if you are looking for a way to support your health. Hemp products provide important omega-3 fatty acids, and they have a delicious, creamy taste. Soy milk is a common substitution for cow’s milk, but the truth is that this milk isn’t always the best option. Most of the soy is now produced using genetically modified seeds, and these GMOs can be quite dangerous to your health. If you choose to drink soy milk, you need to be very careful to make sure that you understand the source. If you choose a high quality soy milk, then you can use this as a substitute without worrying about the GMO ingredients. Just make sure to do your research about the manufacturer before buying the product. As you can see, there are many options that are available to help you decrease the consumption of cow’s milk. These alternatives are delicious and they support your health at the same time! For more information about the benefits of avoiding dairy, make sure to read Unravel the Mystery.